To love a painting is to feel that this presence is… not an object but a voice. In general I am found of Renoir’s work; but I do so love this painting. The colors are exquisite, but I am most drawn to those little hands, hard at work and perhaps a bit of a pouty face. 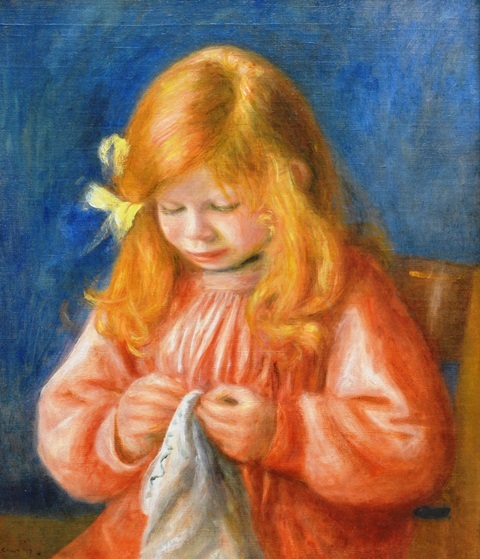 Renoir has beautifully captured this child’s intensity, a quality they may have well inherited from their father, but one never knows! Art can never exist without naked beauty displaced. This entry was posted on April 24, 2018 at 12:01 am and is filed under Art, SlideShow. You can follow any responses to this entry through the RSS 2.0 feed.